Tie tea bags onto a wooden spoon. Fill a small pot with 2 cups water; add wooden spoon with tea bags. Bring water to a boil and remove tea bags. Add rice to boiling tea water, reduce heat to medium-low, cover pot, and simmer until rice has absorbed tea water, about 20 minutes. Stir sesame seeds and salt into rice. Place a steamer insert into a saucepan and fill with water to just below the bottom of the steamer. Bring water to a boil. Add cabbage, cover, and steam until tender yet still crisp, 5 to 10 minutes. Remove steamer from heat. Place edamame and almonds in a small pot; add enough water to cover. Bring water to a boil, remove pot from heat, and drain. Chop edamame and almonds. 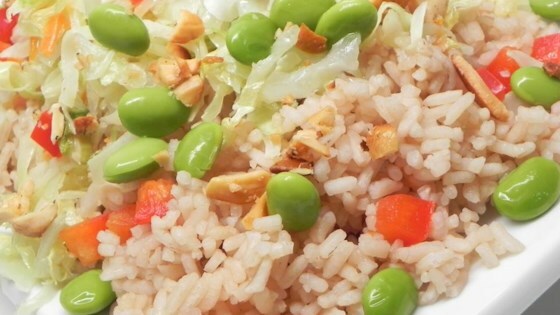 Combine cabbage, red bell pepper, edamame, and almonds in a bowl; serve over tea-infused rice. See how to make sensational lamb-stuffed cabbage rolls.